Saddle Fit With Thermal Imaging. Making the Invisible...Visible. In the video above, Dr Joanna Robson explains why saddle fitting is so critical to your horse's performance and how saddle fit is assessed. Thermal Imaging is one option for assessing your saddle's fit. Infrared saddle fitting showing uniform pressure and an excellent fit. 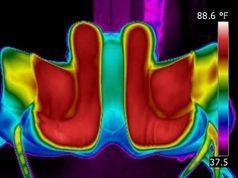 Thermal Imaging technology is excellent for use in Saddle Fit evaluations because we can quickly and accurately show the contact pattern of your saddle—areas where it is in greatest contact with your horse’s back, and if there are any areas exerting uneven pressure. The scanning process includes proper horse preparation by you (see an outline of this process under the Thermal Imaging section of our site, here), followed by taking two sets of images. The first set of images is taken of the sides and top of your horse and the underneath of the saddle, before the horse is exercised. Then, the horse is saddled and we ask you to ride for a short while, after which the second set of images is taken. Following your ride we ask you to remove the saddle and we re-image the underneath side of the saddle and the sides and top of your horse. Both sets of images are expertly reviewed to provide valuable information as to the fit of the saddle and, if there are fit problems, the effect that the incorrect fit is having on your horse’s back. Problems such as bridging, saddles which are too wide or narrow, even lumpy flocking can all be picked up with Infrared imaging. For more information and answers to Frequently Asked Questions about Thermal Imaging, check out our FAQ page.